Once again I apologize for not posting. I have been on a few truly unforgettable trips that I must write about. But, I feel the need to go in chronological order. So, first I will write about the smaller trips. I will try to have a new one every week. After years of getting very lost, ending up on narrow windy back roads of Japan near heart-stopping cliffs Mark and I finally purchased a Garmin. So I no longer know the directions to any of the places we visit; I only know the coordinates. I will leave the directions up to Google Maps. You can put the coordinates into your GPS device or print out a map. Isn’t the world going to end this year? I think this trip started because of a Cracked article. I love Cracked. At the time of this trip I was a high school English teacher in Japan and didn’t do much at work because… (I could go into the many failures the public school system has of teaching English but, I won’t. So let’s just say…) my classes get cancelled a lot. Out of boredom, I read a lot at work; books, newspapers (online), Japanese lessons, and when I really just want to have fun, Cracked. There are several articles like, Abandoned Places that will Blow Your Mind, Mind Blowing Forgotten Towns, or Creepiest spots on Earth… that will Blow Your Mind. I love these sort of articles! 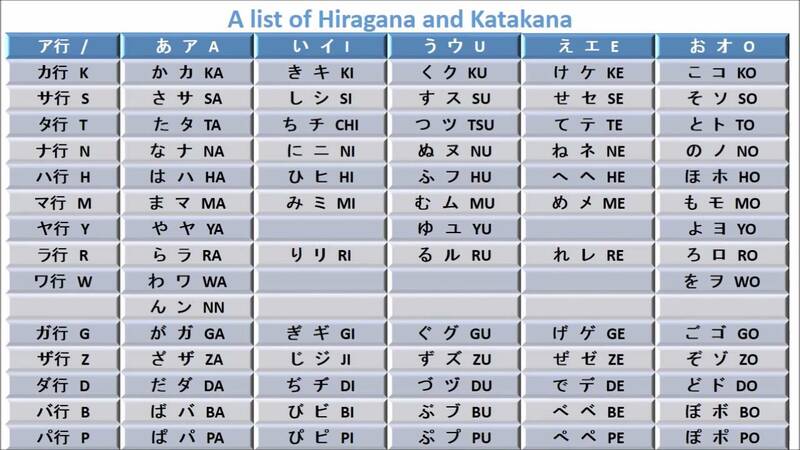 After reading all of them, I noticed that many of these articles include at least one place in Japan. 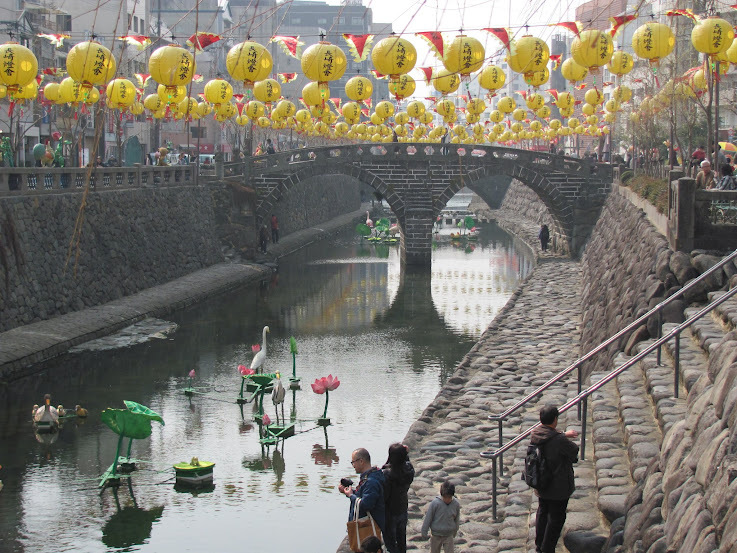 According to Cracked, Japan is a weird place… that will blow your mind. 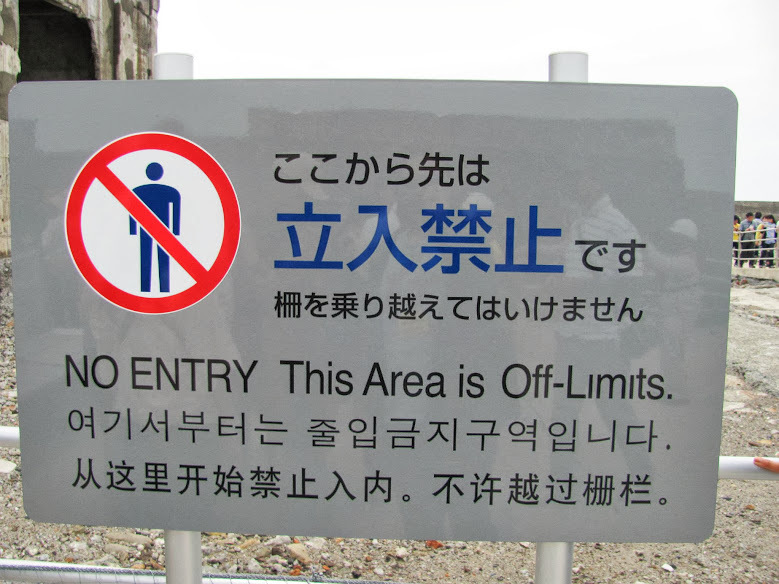 So Japan is creepy. Why fight it? 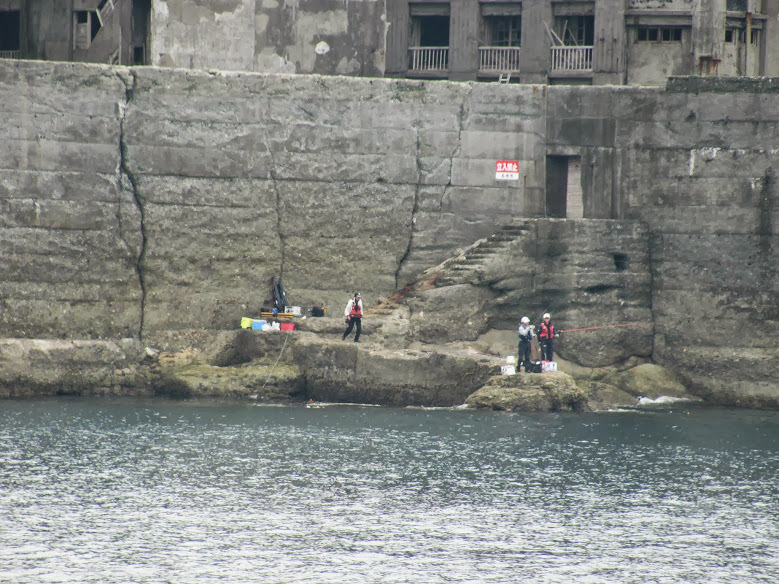 That’s why for Golden Week 2012, the year the Mayan Calender ended and hence the world, we decided to see all the creepiness our Japanese islands, Kyushu, had to offer. It was a mini city that centered around coal mining from 1887 to 1974. Everyone who lived on this island was part of the booming coal mining industry. At its peak, 83,500 people per km2 were packed onto this tiny island. 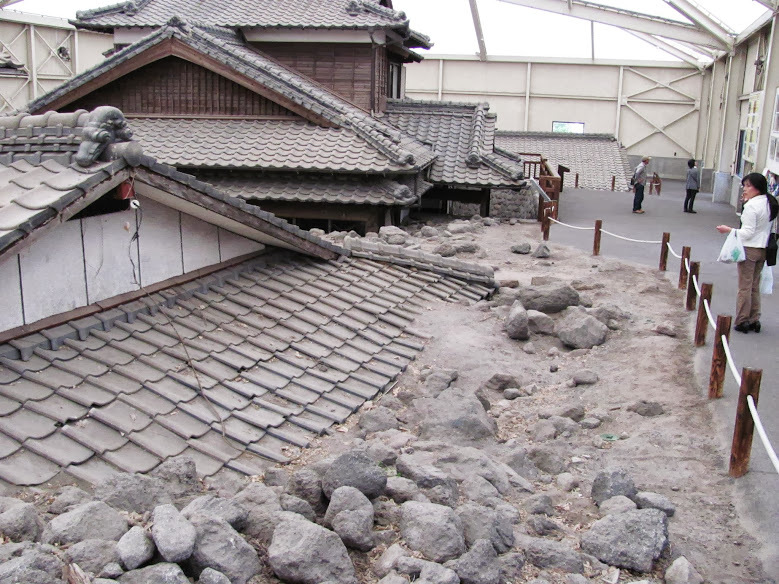 The high walls that protected the people and buildings from tsunamis is what give the place that “battleship” look. But alas, with coal being so dirty, when new forms of energy came along, like petroleum, the coal industry died. And, so did this little mining island. 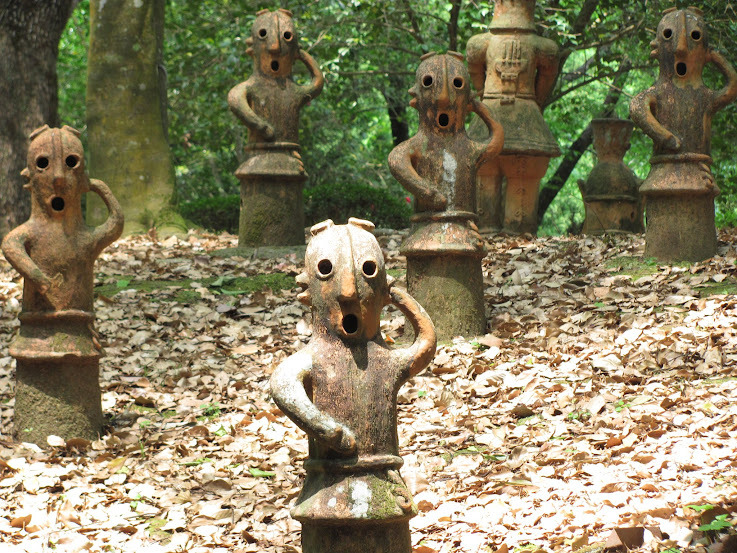 Everyone left and this became one of the creepiest places in Japan. 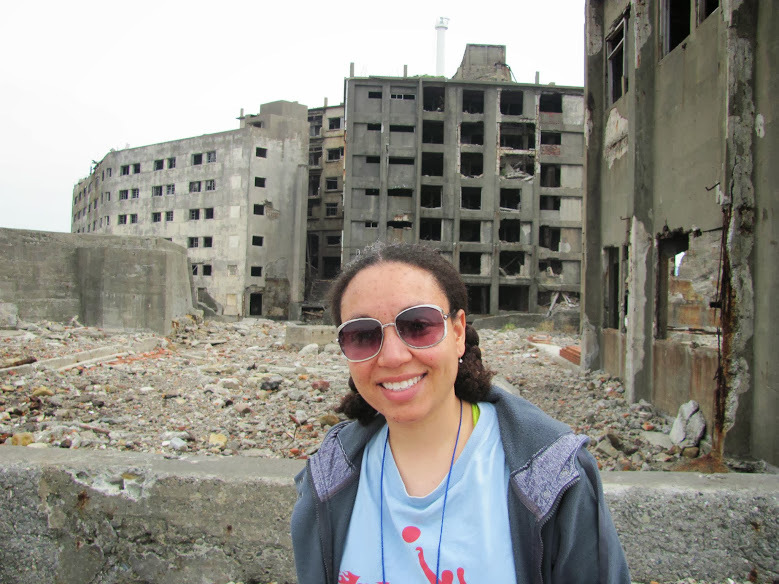 The only people who go to Hashima now are tourists, movie crews, and pop stars making music videos. The tour was a bit disappointing. There is a clear barred off path that you must follow. You are also not allow to stray too far from your tour group even when you stay on the path. The tour was in Japanese, and not very interesting so wandering off would have been the thing to do, except that there is no where to wander! We have parties every night once those naive tourists go home. You can, illegally, pay a fisherman to take you to the island after all the tours are done and explore the island on your own. It is dangerous; abandon islands tend to be huge death traps. Having a nice job, a husband I don’t want to see hurt, and not wanting to end up in a Japanese prison myself made me not adventurous enough to try this method. 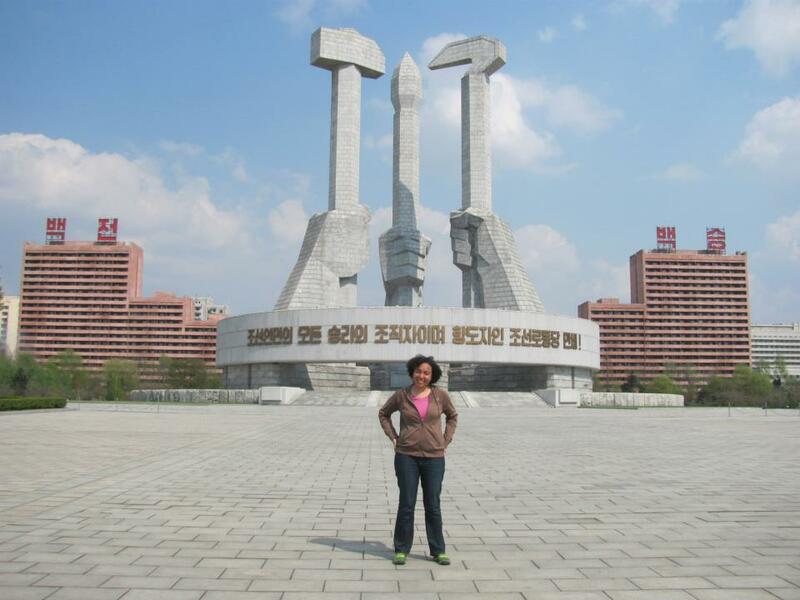 The group tour was good enough for me. 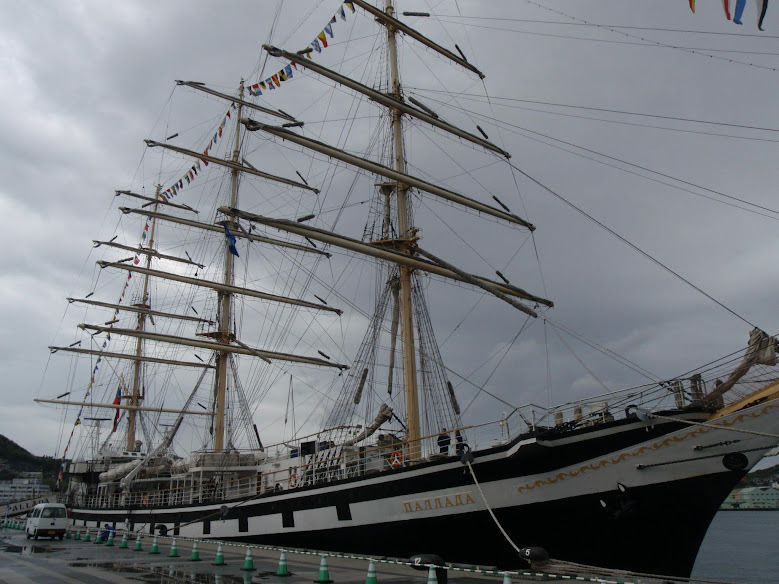 After the tour we went to the Nagasaki Tall Ship Festival. We walked along the dock looking at ships from various countries, mostly Russia. We had tickets for something to do at the festival, but we didn’t know what it was. All I knew was that I had paid for some activity that had something to do with a ship. I had to get the ticket a couple weeks before the festival and it involved me using the Japanese return postage post card for the first time ever. The tickets were not expensive, but the process was very complicated. I figured it must be something really special. It was for a ride on a ship which sailed around Nagasaki harbor. Eventually, after I got nauseous, we did go above deck in the cold rain to see the harbor from the sailboat that was not sailing. 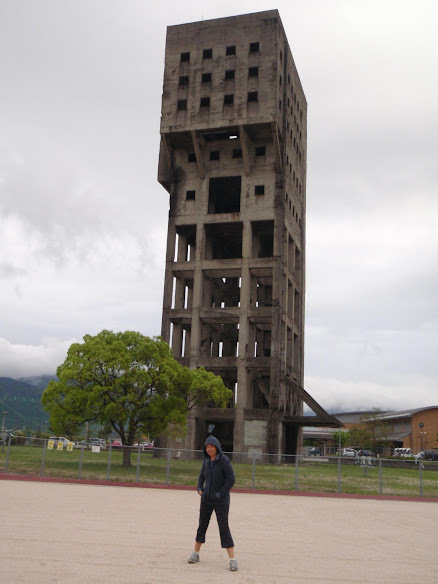 Also on the list of disappointments was the Old Nagasaki Prison. Apparently 2012 was it’s apocalypse. 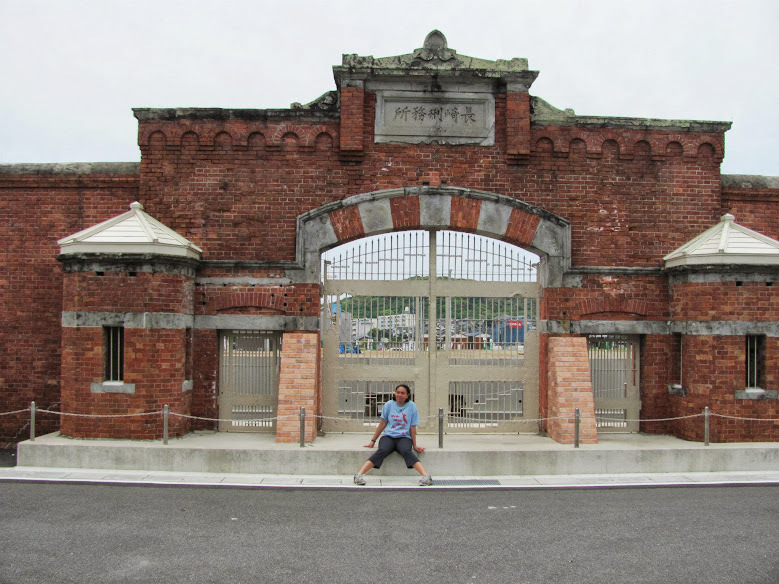 When we got there only the main gate was still standing… and it was cleaned up! A few month earlier the town decided to tear down the old prison because people kept breaking in to the old building to take photos. What kind of freaks would do that!? Next we went to Obama! But this Obama had a village that was wiped out by a mudslide in 1990 that was started by a volcano. 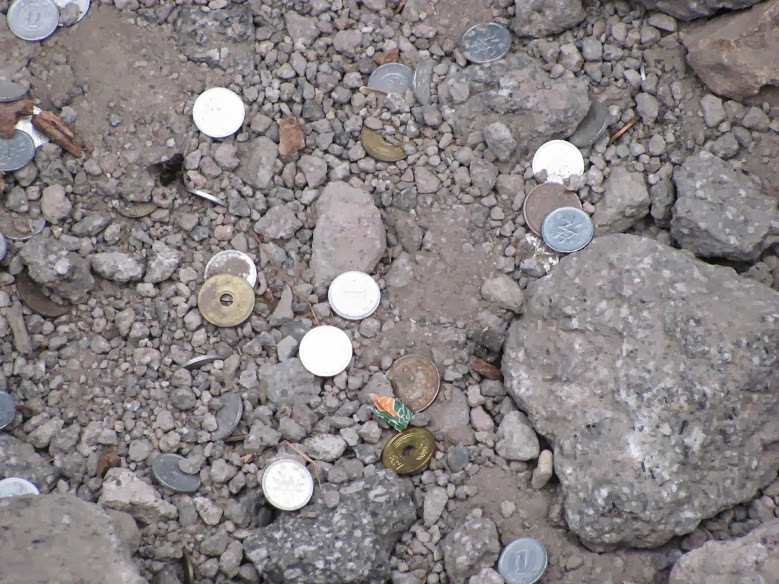 One small part of the village was left as it was after the disaster as a memorial. We walked around the houses taking pictures. We didn’t visit the museum or the school because we were running out of time. We needed to drive to Fukuoka and set up our tent before the sun set. Because we were running a little behind schedule, we took the much faster toll express way to Fukuoka rather than the cheaper and slower highway. The toll road has the added benefit of having more signs giving directions, signs that are written clearly and in Romaji, two lanes most of the time, and people who drive like they want to get their money’s worth from a toll road. On toll roads you are less likely to get lost and that alone is worth something when time is not in abundance. What road are we on? 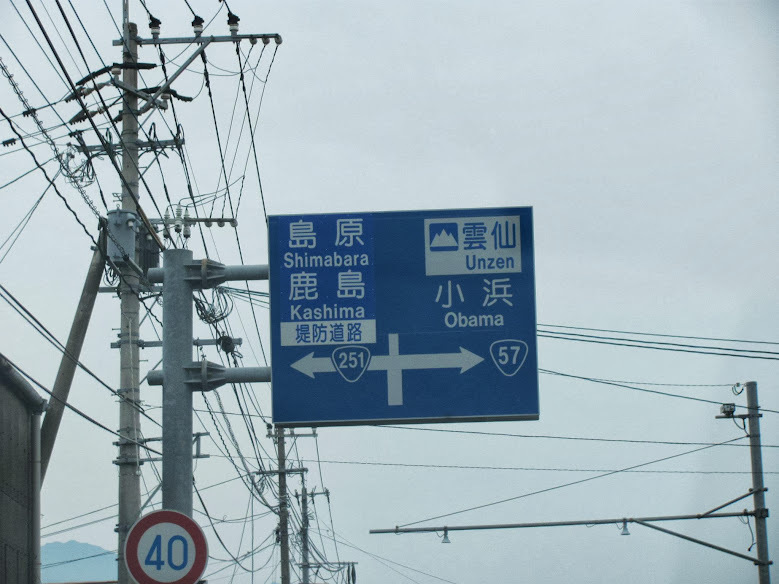 I gather that signs are very expensive here in Japan, since one can drive for miles without seeing one. Some stop signs as well as most speed limit signs are actually painted on the road. When using a paper map you first need to figure out where you are. Back in the states you can see signs along the road that tell you what road you are on. 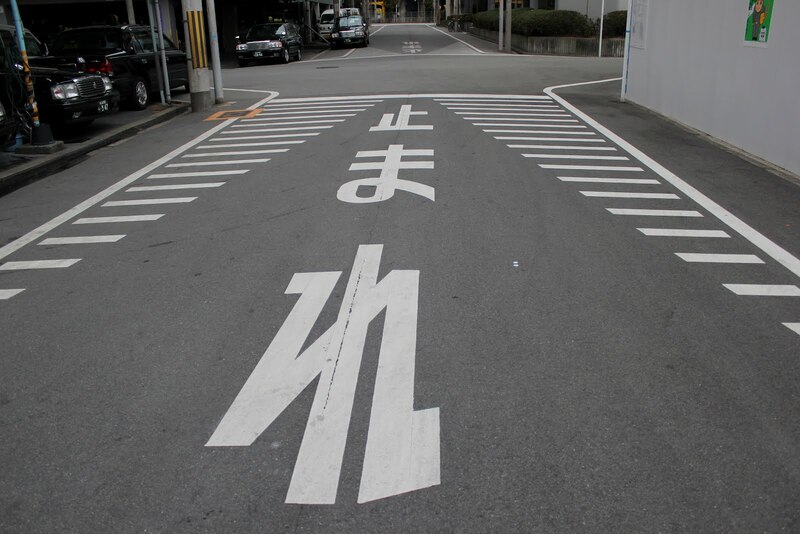 In Japan this is considered a waste of sign making material. You will only see signs for what road you can get to, and sometimes even then it’s anyone’s guess. Many times to figure out what road I am on, I will turn off onto another road, make a u-turn, and read the sign at the intersection. I think the main reason why tolls are so expensive here is the cost of making all the extra signs. 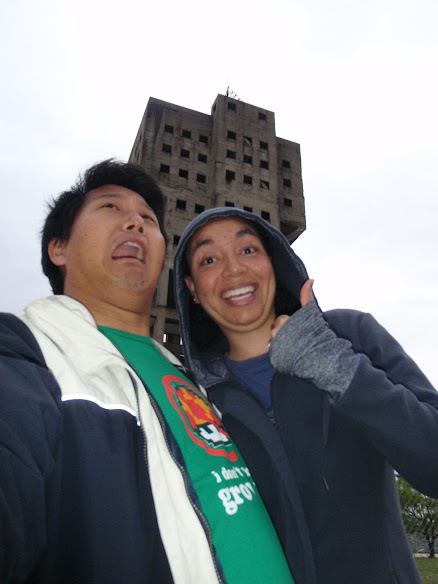 We did manage to get to Fukuoka early enough in the afternoon that we visited the anti-zombie tower before heading to the campsite. It was very nice for a tower-that-you-can’t-go-near-because-it’s-not-actually-a-tourist-attraction. 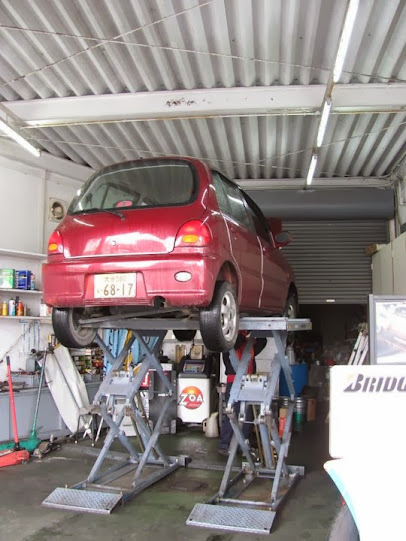 This is actually a photo of my car getting an oil change, but it looked quite similar. This is the really apocalyptic part of the trip. After this neither Mark nor I were in any mood to continue so we went home. It started after leaving the anti-zombie tower… I don’t know why I have no photos of the trip from this point on. I did take pictures, but they are all gone… so are Mark’s photos. …odd. We didn’t have good directions to the campsite. But, we did get to the general area. We stopped at a convenience store and asked, “Camping wa doko desu ka?” It was a badly composed sentence asking basically, “Where is camping?” It was good enough to get my inquiry across. The campsite didn’t really have a name other than east side of the Fukuoka mountain campsite, or something like that; not something that people who have not camped there would know. We were within a couple miles of the campsite, at the base of the east side of the mountain, but still no one knew where it was. The sun had retreated for the day and it was too late to put up a tent. Defeated, we headed to downtown Fukuoka and got an internet cafe for the night. We were able to look up the campsite online and find exact GPS coordinates as well as other things to see that would fit into our end of the world themed holiday. The next day, early in the morning, we drove to the campsite and put up the tent. It was a free campsite! The day was a bit windy, but we were up a mountain. The sun was out; it was a nice laundry-doing day. We were running low on clean clothes. The plan was to go back down the mountain, find a laundromat to do some washing, fill the car with gas, get some supplies, then chill at the campsite for the rest of the day, or two, or three. We had plenty of days left on our Golden Week holiday. I never put the most expensive type of gas in my car. When I filled up this time I selected the cheapest option and filled the tank. When I was done I felt really proud of myself. 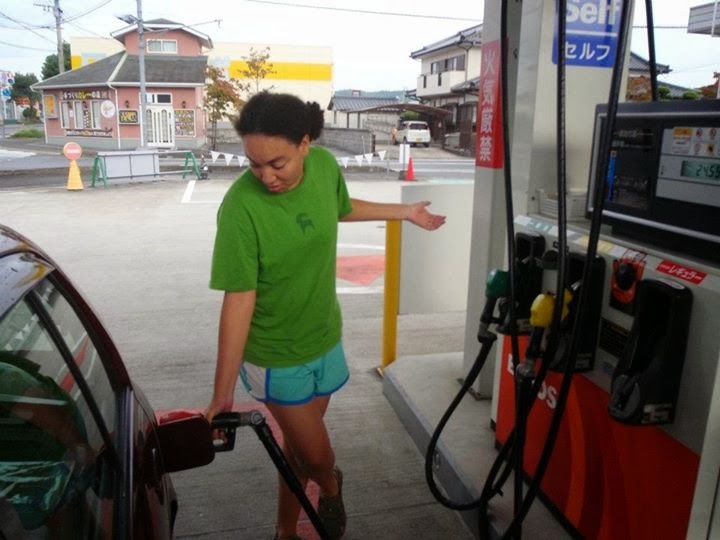 Pumping my own gas is something I’ve always had trouble with in Japan. It’s a complicated task mainly because the pump asks you so many questions, all in Japanese, before you can get the gas out of the machine. Once the screen at the pump turned into a slot machine and before I knew it I was gambling! I know it looks easy, but you really need a master’s degree in Fluid Dynamics to fill your own tank. Once I used a pump with an option for English. Many of the questions had to do with method of payment, whether or not a discount/ club card will be used. Is an oil change needed? Does the car need to be washed or wax? Are you free this weekend? What’s your blood type?How do you get your hair so shiny? Mark and I got back into the car. We were about to cross the street and park at the laundromat when my car shuttered and died. I tried restarting the car. Nothing. Not even a cough. It was dead. “What color pump did you use?” Mark asked. Luckily, but not luckily enough to have not put diesel in a gas car, the car stopped right at the gas station. The attendants hoisted the car, drained out the diesel, cleaned the tank, and filled it with gas all while we did our laundry across the street. I think the whole thing cost us about 85USD, not including the tank of diesel that we never used and the new tank of gas. At this point we were still within our holiday budget. The cost of taking the diesel out was not too pricey. We could still continue. We headed back up the mountain to our campsite after getting stuff for lunch and dinner. We would make the best of it. This should have been a sign. It’s been years since I had regular access to a dryer and every time I used one it’s like I don’t know what can go in there and what cannot. I usually end up shrinking half my clothes. So, now I just stay away. Mark did put in one load of jeans, socks, and underwear. The rest we took back to the campsite to hang up. It was quite a windy day, so I didn’t think it would take long for our clothes to dry. When I went to hang out our laundry I realized that I had forgotten to bring clothes pins. I had to hang up the clothes by stringing the line through the t-shirts and other items. It’s a good thing the socks were already dry! We sat in a little cement shelter and ate lunch as we watched our clothes blow madly in the wind. The rest of the day was spent looking down on Fukuoka from our mountain top campsite. The trees were really bending. Around dinner time our clothes were dry, but it was dinner time. We were going to eat then take the clothes in, but even hours after eating we still had not taken anything in. When it started drizzling we put everything that wasn’t in our tent in the car except for the clothes, which were now wet again. There was no point since they would have to be hung out again later. When it started to rain harder we went inside our tent. We watched a movie on my android then fell asleep. I woke up in the middle of the night when something hit me in the head. It wasn’t a hard hit. I thought that maybe Mark was moving around in his sleep and had knocked my head, but he was not near enough to me to do that. Then I though I had just dreamed it. I turned over and went back to bed. Then it happened again. This time twice in a row so I knew what had hit me. The wind was so strong that it was making our tent lie down. I was being hit in the head by the top of our tent. I looked around our tent; I mean really looked around this time. Everything was wet. Our tent was a pool. I woke Mark up and we went outside for a look at the campsite. I saw our clothes still on the line. It’s a good thing I forgot those clothes pins. That would not have been secure enough to keep those clothes from being blown off the mountain! Me – This is what happens when you don’t watch TV. You don’t find out about the hurricane that is heading to your campsite. Mark – Should we take down the tent and drive into town. Me – How safe to you think the roads down the mountain would be? Mark – You mean because there are no lights, it’s a windy road with falling rocks on one side and cliff drops on the other, and everyone speeds? Me – Let’s just stay here. So Mark and I got our towels, dried our tent out the best we could, and went back to sleep. Except we didn’t actually fall asleep. I kept waking up when the top of our tent hit me in the head. I worried that something, like our car, would be blown on top of our tent. I slept 5 minutes out of every hour, but at least I was not cold; just scared. 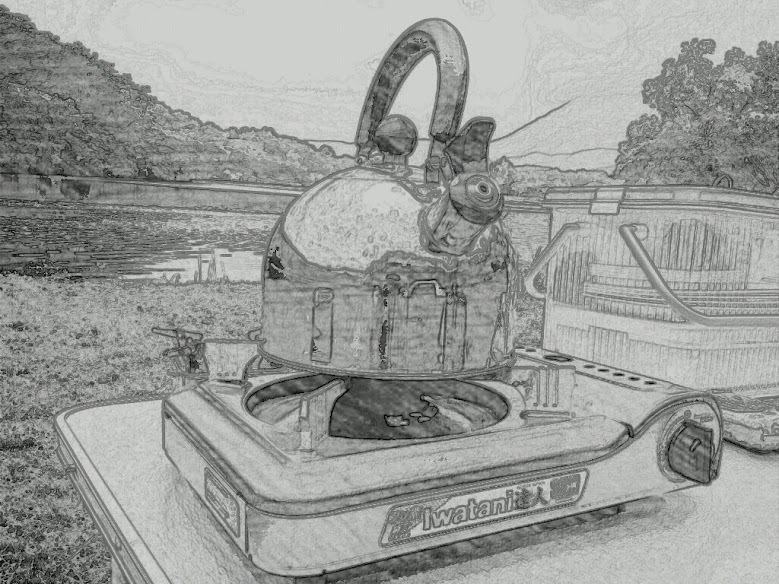 I must say something about our camping equipment. The next day I looked at our tent and all the poles were just fine. 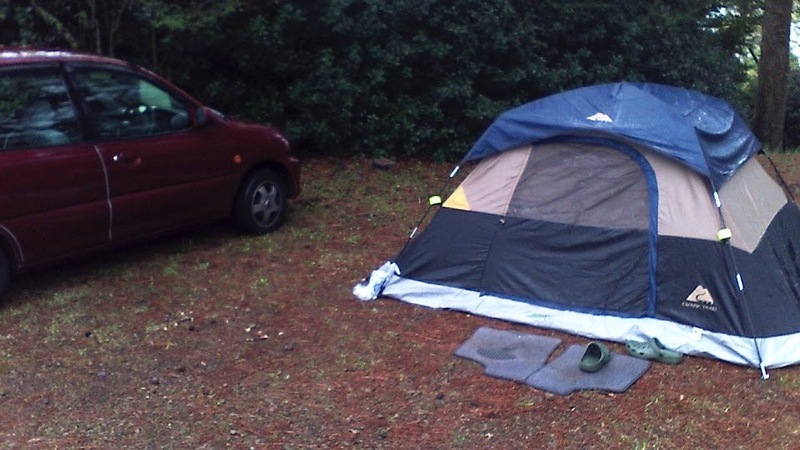 We do not have a very expensive tent. It’s just an Ozark Trail 4-person tent my mom just randomly bought us, when she couldn’t find the tent we left at her house. But that little tent took a beating and survived! There was a lot of water in the tent, but the tent itself was not leaking. We sprayed the tent with Nikwax just before we set out for this trip. Water got in when the wind blew up the fly and when the wind blew the tent flat on the ground. Our sleeping bags by Suisse Sport kept us nice and warm and mostly dry. They are reversible, meaning that it doesn’t matter which is the inside and which is the outside. But if you sleep with the blue side out, it will keep you dry if your tent leaks. Sometimes the zippers are hard to use in the dark, but other than that I have no complaints. By morning we had had it with Fukuoka and this trip. We packed up the car with our wet tent and wet clothes and went home. It took 2 days to dry everything out. But I still love camping. InternationalATMs are really hard to find; more so if you aren’t in a big city. Many places in Japan do not use credit cards.TakecashandcallyourbanktoaskwhatATMs or banks in Japan will work with your cash card. You can get in by plane, train, and bus. 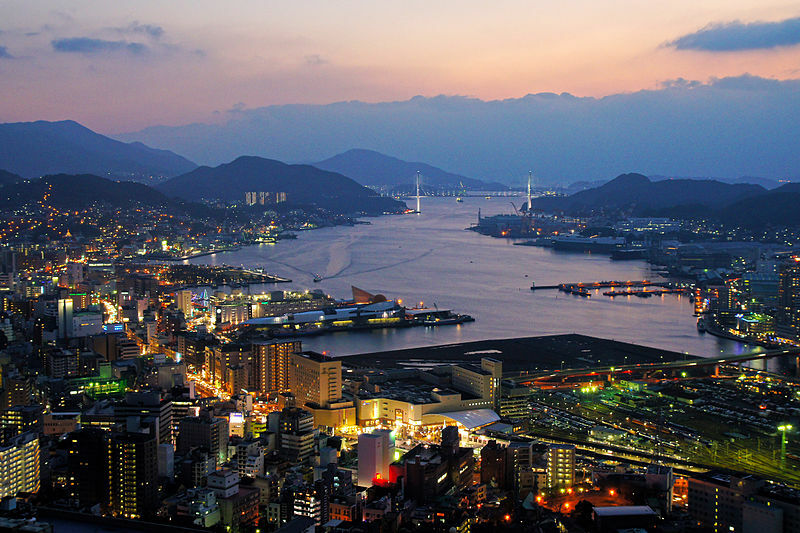 The nearest airport is and hour away from the city of Nagasaki. 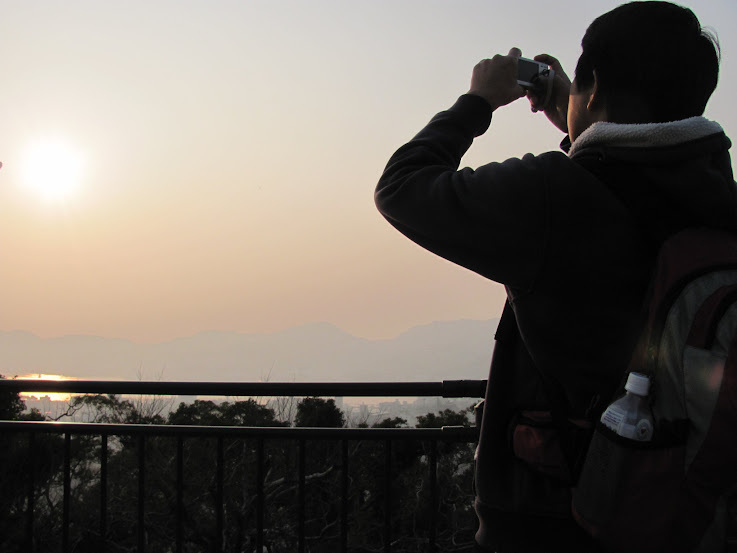 Hostels are a cheaper alternative to hotel accommodations while in Japan. But, if you have a car, this might not be true. You’ll save money on a bed only to spend it on parking. Many hostels do not have free parking. 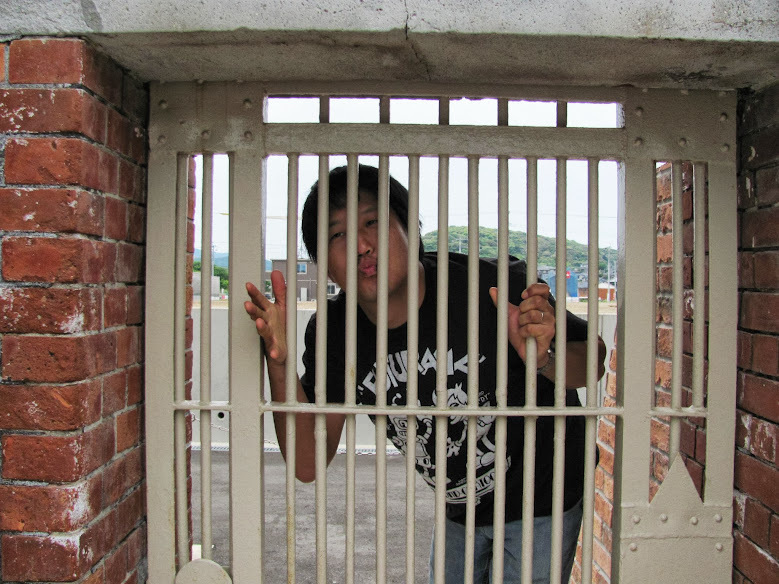 If you have a car while visiting Nagasaki, consider staying at an internet cafe. Internet cafe, called media cafes or netto cafes (ネットカフェ) in Japan are equipped for overnight stays. They are usually near train stations or in strip malls. Many come with showers, clean towels, and toiletries for free. All offer free drinks (coffee, tea, soda) for the duration of your stay. Most, though not all, have free parking. On this trip Mark and I stayed at Planet-Cafe. We had to pay a one time 300 Yen fee for membership then, I think, 2,300 Yen each for a single cubical. The price for 2 singles and 1 double was about the same, so we got separate compartments. We parked in the paid parking lot of a nearby mall and had our ticket validated by the cafe; parking for us was free. You will need to be part of a tour. The ferry leaves from the Nagasaki Port Ferry Terminal (near the Ohato tram stop). The boat ride takes about 50 minutes each way. There are 2 ferries a day. There is a 300~400 Yen discount per person if you reserve groups of 15 or more people. For 4~500,00 Yen you can also charter a boat and go by yourself (with the tour company) or with just friends. There is a pledge you will have to sign. It can be download or you can get one when you buy your tickets. Tours maybe cancelled due to bad weather conditions. You cannot go to the island on your own legally. 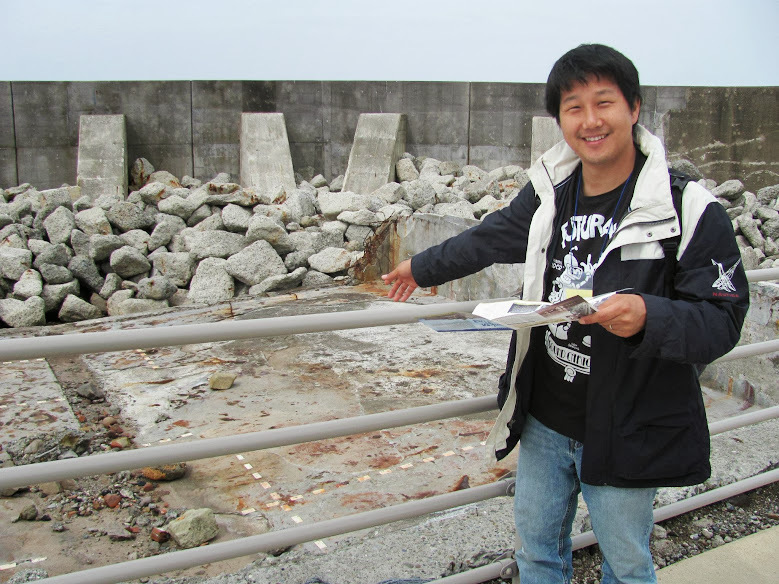 Got to the Nagasaki Port (Nagasaki Seaside Park, Dejima Wharf) near the Ohato tram stop. Disembark at the Power Dejima stop, then take the electric tram from the Nagasaki stop on Nagasaki JR. There is no charge to look at the ships. 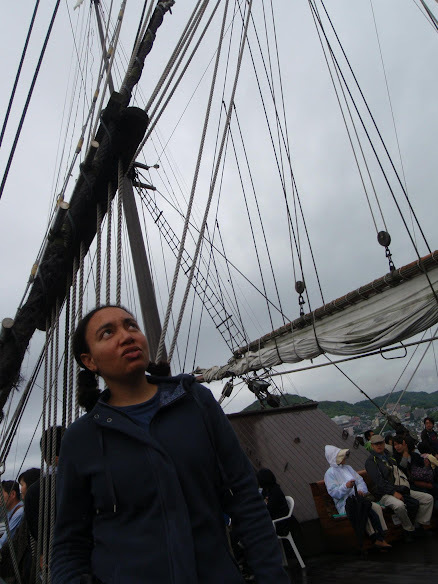 It costs about 1,000 Yen to take a ride on the Kanko Maru Tall Ship. You must get your ticket before the day of the ride. There is a limited number of tickets. Call for more information. This event goes on for several days. At night there is a light show. Other than the main gate, there is nothing left of the old prison. ****UPDATE***** The main gate might have been taken down too. The school cannot be reached by public transportation. 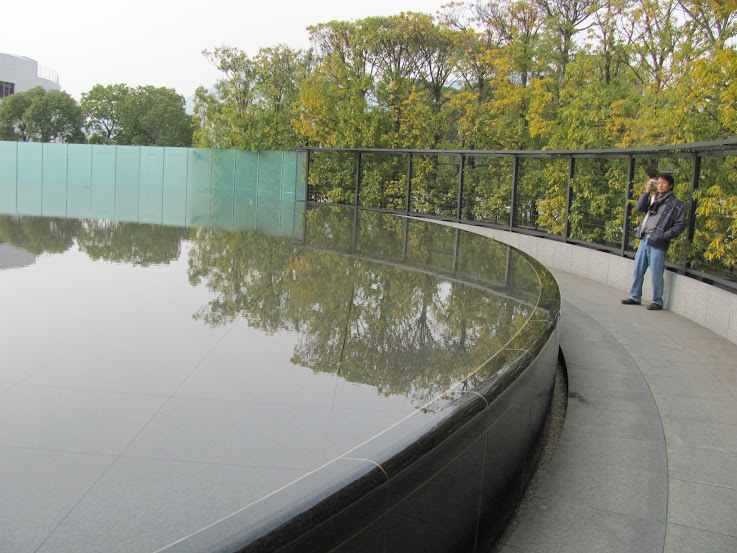 It is a 40 minute walk and 15 minute drive from the museum. There is plenty of free parking at the adjacent ball park. It’s free to look at. You CANNOT go into or unto the tower, unless of course, you are being chased by a zombie horde. 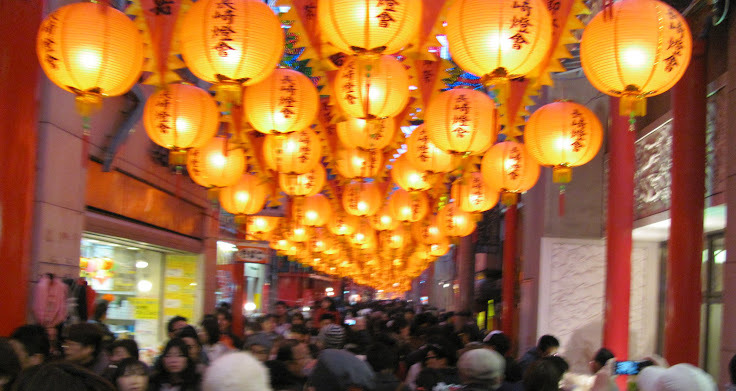 Anyway, one of the girls at the party told everyone about her plans to see the Nagasaki Lantern Festival. She said that she was doing all the planning and invited anyone who wanted to come along. Of course, I rarely turn down trip invitations. Is there a cheaper way? The group of girls planned on taking the train from Oita to Nagasaki. Well, there were actually two trains. Each would cost more than $40. 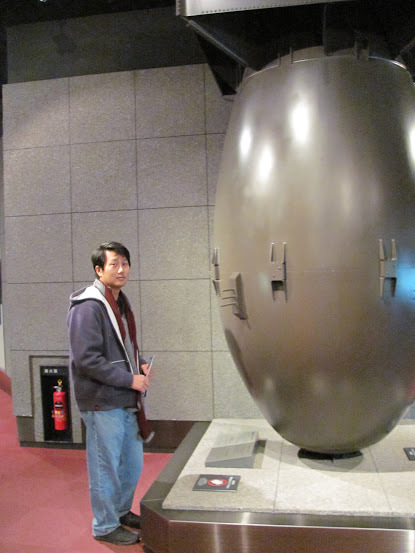 That means to get to Nagasaki would cost about $90, to get back, about $180. And, for both Mark and I to go there and come back it would cost about $360. So we decided it would be cheaper for us to drive. It would also be quicker and we wouldn’t have to spend a lot of time waiting for trains. 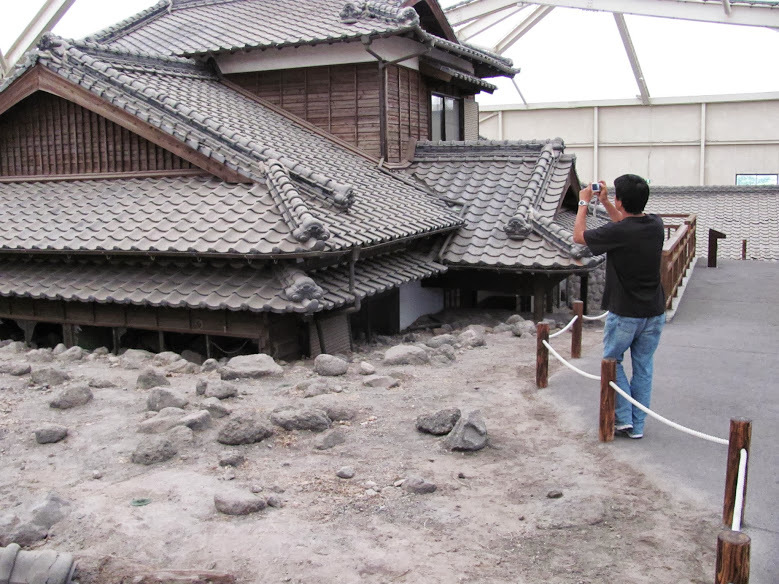 It seems like it was, unless there was someway to get tickets to Nagasaki for less than 7,700YEN each. There was the added benefit that the train trip would have taken about 5 hours. But it took about 2.5 hours to drive to Nagasaki from Oita. Once in Nagasaki we parked to car at the cheapest parking lot near the hostel and left it there. The 500YEN each cost of the day pass for the trolley was cheaper than moving the car and paying for parking elsewhere. We’ll meetup eventually, I hope. Normally I would have offered to give a ride to anyone going on the trip, but I didn’t know when Mark and I would leave. When I got home from work on Friday Mark and I ate dinner then scrambled to do some last minute chores before heading out. We left Oita after everyone else. But because driving is so much faster than taking the train, we still managed to get to Nagasaki before anyone in our group; a long time before. Mark and I were sitting in the lounge watching a movie when most of the girls arrived. They were too tired to do anything that night and headed off to bed. The next morning Mark and I woke up and talked with some of the girls to see what they had planned for the day. Half of them were still asleep, so Mark and I decided to head out to Peace Park and meet up with the girls later. But we would end up seeing very little of them throughout the day. So the plan was to go to Peace Park then call the group to see where we should go to meet up with them. But there was always something to see not too far from where we were that we wanted to see before calling them. One of the little “must sees” was Spectacle Bridge. According to our little map, that was given to us by our hostel, if we found the heart shaped stone and touched it together, we would stay together forever. I have no idea where this stone was. Mark and I spent a good 20 minutes looking for it with no luck. Then Mark found the stone in the picture above that, at certain angles, could look a bit heart-ish. That was good enough for us! There’s something amazing on stage. Just ask that kid about it. 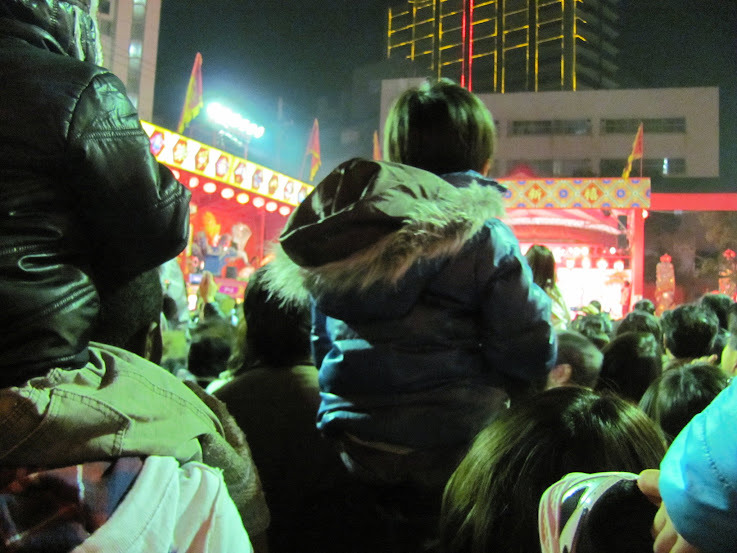 We saw the Lunar New Year’s festivities, or as much of it as we could see behind the heads of kids on their dads’ shoulders. During the Dragon Dancing we did find and lose our friends. They were going to see something we had seen earlier and we were going to see something that they had seen earlier. We promised to meet up again before going back to the hostel. But while waiting for them, I got cold and tired so Mark and I walked along the river. We didn’t meet up again. Maybe the next trip, we’ll have better luck. InternationalATMs are really hard to find;moreso if you aren’t in a big city. Many places in Japan do not use credit cards. Take cash and call your bank toaskwhatATMs or banks in Japan will work with your cash card. 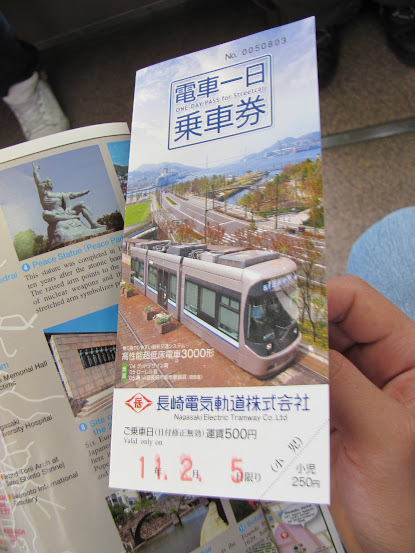 Take a tram from Nagasaki eki mae station just in front. Tram No 3 towards ‘Hotarujaya’ will take you to ‘Kokaido mae’station in 4mins. When you see the river, cross the bridge and turn left immediately. Soon, you will see our hostel’s orange sign ‘AKARI’ on your right, at the riverside. You can get a day pass for the tram at the reception. You have to go to a hotel, hostel, or a souvenir shop to buy one. You cannot get one on the trolley. Good only for the date stamped on the pass. This is not a 24hr pass. The following are other ticket options for the trolley. 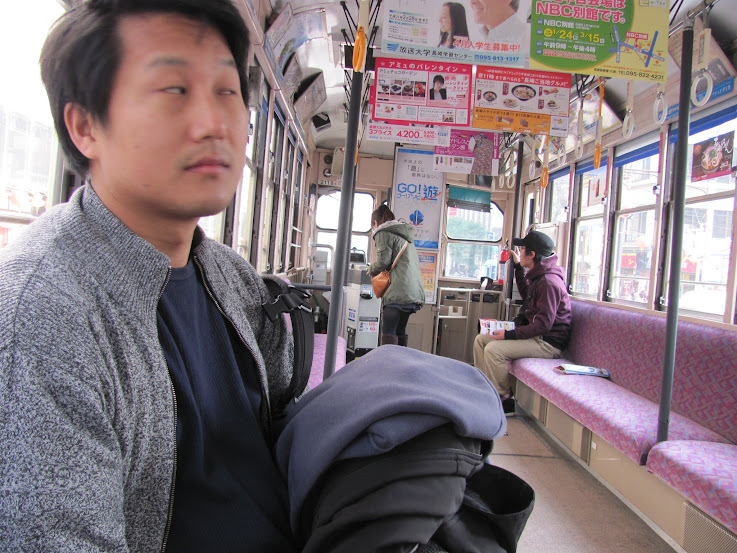 Take a limousine bus to Matsuyama stop. The Hall is about 5 minutes walk from here. 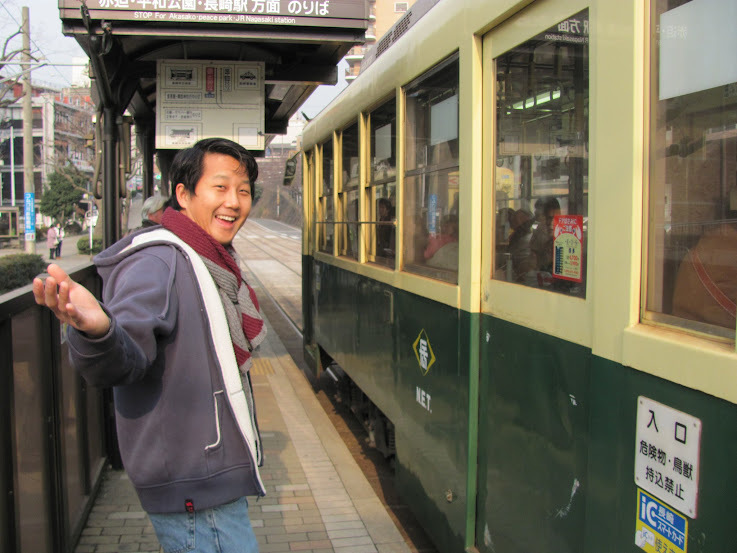 Take a tram or local bus to Hamaguchi (#20) or Matsuyama (#19) stop. It is a 5 minute walk from here. it is just a five minute walk. 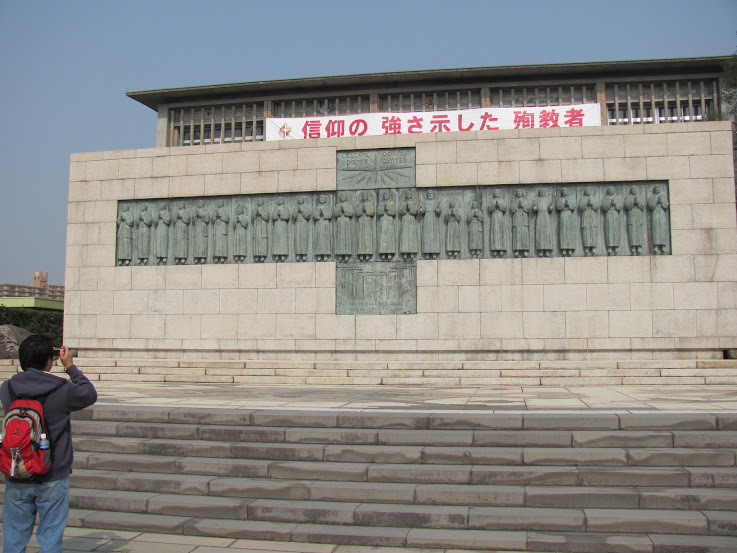 This is right next to the Nagasaki National Peace Memorial Hall. 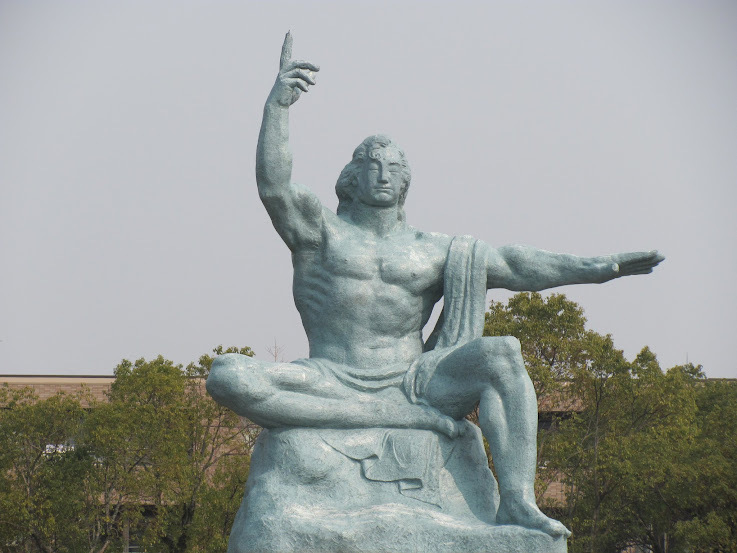 This is within walking distance of the Nagasaki National Peace Memorial Hall and the Nagasaki Atomic Bomb Museum. You can go into the museum if you think it’s worth it. 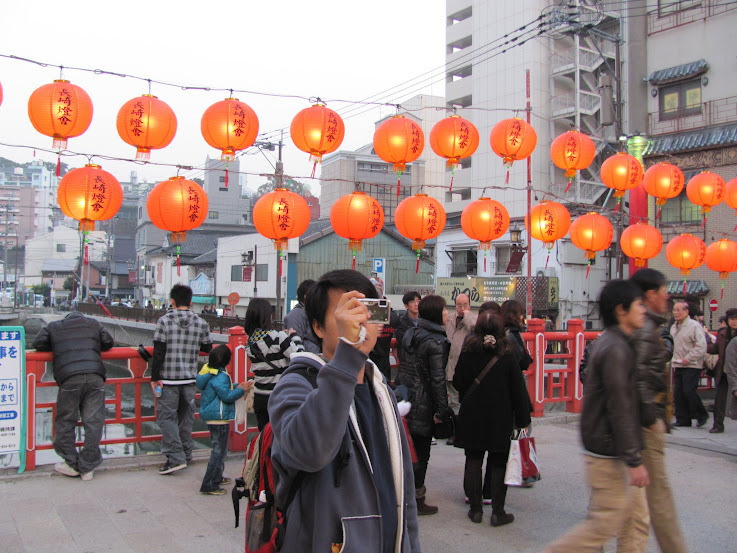 Go to either Nigiwasashi (#37) or Kokaido-Mae (#38) stations and walk to the river. 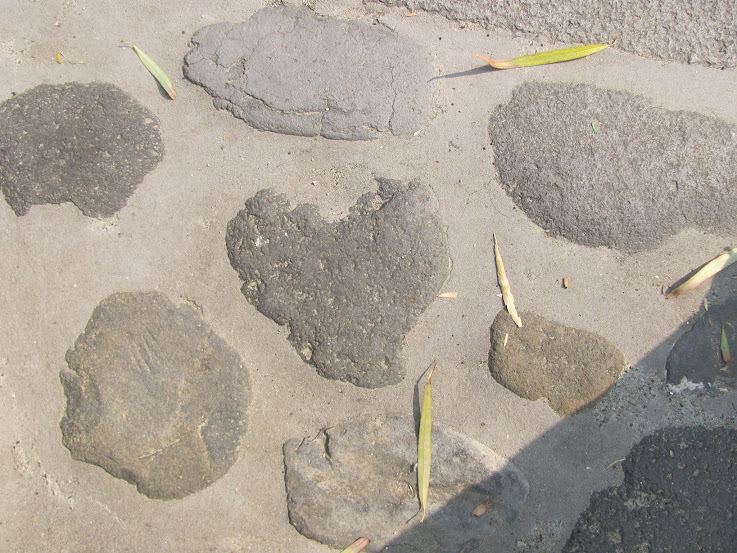 Supposedly, if you are single and you find the heart shaped stone you will find your true love if you touch it. For couples who find and touch the stone, they will stay together forever. Go to Kokaido-Mae (#38) station and follow the signs to the park. You will have to walk up the mountain through a cemetery. It’s a half an hour walk. It might close sometime after sunset. 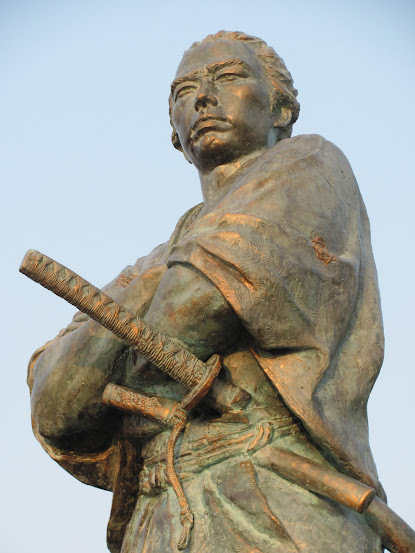 The statue in the park is of Sakamoto Ryōma. Go to Tsuki-Machi (#31) Station.